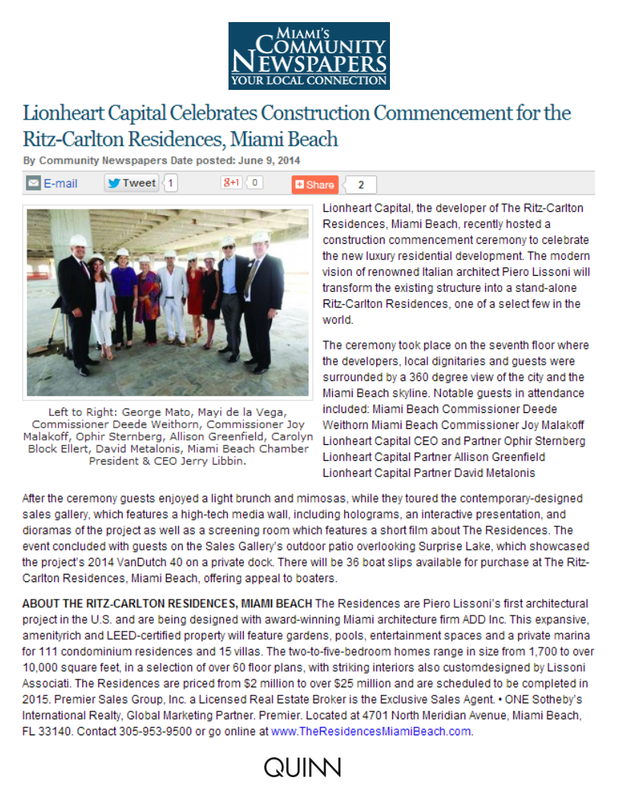 Lionheart Capital, the developer of The Ritz-Carlton Residences, Miami Beach, recently hosted a construction commencement ceremony to celebrate the new luxury residential development. The modern vision of renowned Italian architect Piero Lissoni will transform the existing structure into a stand-alone Ritz-Carlton Residences, one of a select few in the world. After the ceremony guests enjoyed a light brunch and mimosas, while they toured the contemporary-designed sales gallery, which features a high-tech media wall, including holograms, an interactive presentation, and dioramas of the project as well as a screening room which features a short film about The Residences. The event concluded with guests on the Sales Gallery’s outdoor patio overlooking Surprise Lake, which showcased the project’s 2014 VanDutch 40 on a private dock. There will be 36 boat slips available for purchase at The Ritz-Carlton Residences, Miami Beach, offering appeal to boaters. ABOUT THE RITZ-CARLTON RESIDENCES, MIAMI BEACH The Residences are Piero Lissoni’s first architectural project in the U.S. and are being designed with award-winning Miami architecture firm ADD Inc. This expansive, amenityrich and LEED-certified property will feature gardens, pools, entertainment spaces and a private marina for 111 condominium residences and 15 villas. The two-to-five-bedroom homes range in size from 1,700 to over 10,000 square feet, in a selection of over 60 floor plans, with striking interiors also customdesigned by Lissoni Associati. The Residences are priced from $2 million to over $25 million and are scheduled to be completed in 2015. Premier Sales Group, Inc. a Licensed Real Estate Broker is the Exclusive Sales Agent. • ONE Sotheby’s International Realty, Global Marketing Partner. Premier. Located at 4701 North Meridian Avenue, Miami Beach, FL 33140. Contact 305-953-9500 or go online at www.TheResidencesMiamiBeach.com.